According to late Third Era accounts, before their vindication in the eyes of the civilized Dunmer, the Ashlanders were very xenophobic, shunning all outlanders, and were known to be aggressive towards foreigners in their lands. However, if an outlander performs a good deed for an Ashlander clan, he may be named Clanfriend, and thus be adopted into the tribe. Following the disastrous Red Year, widespread worship of the Tribunal ended. In its place the former Dissident Priests took full control of the Temple and sought to reinstate worship of the "Anticipations" (Azura, Mephala, and Boethiah) as the "New Temple". 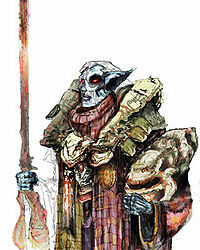 Fittingly, the daedra were dubbed the "Reclamations", as if they were reclaiming their status from the Tribunal. The rise of this New Temple almost completely vindicated the previously persecuted Ashlanders, who had persevered in worshipping in the three daedra for millennia. Among the Dunmer, the Ashlanders are lauded for having the "true vision" to keep true to the old ways. It is now quite common for many Dunmer to make the arduous pilgrimages into the ash wastes to seek the counsel of the Wise Women, who have done much to dispel Tribunal worship. They directly connect the eruption of the Red Mountain and the Argonian invasion to the anger of the three daedra. For game specific information, see the Morrowind and ESO articles. Ashland Hymns — This is a volume of folk verses collected from Ashlanders. "Wondrous Love" is from the Urshilaku Ashlanders of the northern Ashlands. 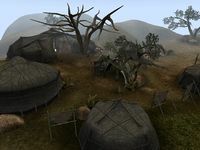 ^ a b c d e f g h i Events of Morrowind. ^ a b Mehra Milo's dialogue in Morrowind.